Here's my first call for the Wednesday storm...if you live in the Shenandoah Valley, there's some more detailed information in the discussion below. I intentionally left out all model-talk (follow me on twitter (https://twitter.com/NoApologyVAwx) if you're interested in that) opting to jump straight into how I see things working out. I plan on issuing one more map---my final call--- Tuesday night at 8pm. Temperatures: Temperatures at onset should generally be in the upper 30s across the Valley. There are two processes that will help us drop enough to support snow. Evaporational cooling (when precipitation falls into drier low levels and evaporates, causing the air to cool) will only be a minor player here since the air mass in place won't be all that dry. Our dew-points leading up to this event will generally be in the upper 20s/low 30s as opposed to the 10s/low 20s we often see out ahead of snow storms (the kind that produce the dreaded virga storms where snow is falling but takes forever to saturate the column and make it to the ground). The bigger player will be dynamic cooling. This will be thanks to the low getting going off the coast...producing heavier rates under strong lift which will cool the column. This is usually the more common method for snow 2 days after temperatures in the 70s. This likely ends up being the case where we are in the low to mid 30s--just above freezing-- with heavy snow falling. Amounts: I do think 3-5" amounts will be common across the entire Shenandoah Valley, with a few more inches in the higher elevations (above 2,000 feet) of the Blue Ridge Mountains, Massanutten, and the Alleghenys where temperatures will be a bit colder. Keep in mind this is a bit lower than the National Weather Service in Sterling who issued Winter Storm Watches for area-wide 5+". 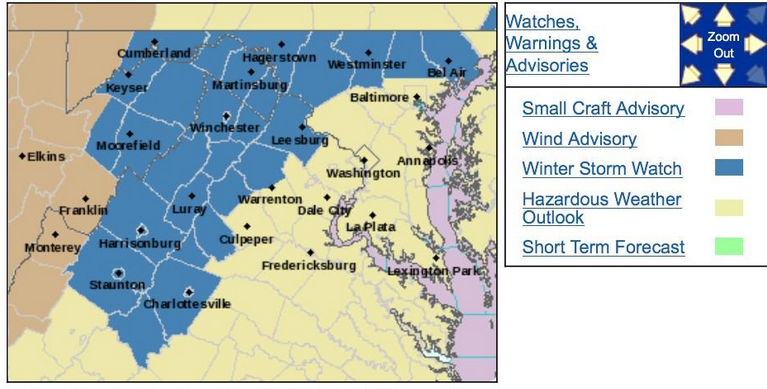 Winter Storm Watches Issued by NWS Sterling for 5+"
If our transition to snow is quick, or we manage to skip the rain stage all-together...I can certainly see this working out. I decided to hedge a bit lower since we'll be fighting to push out this unseasonably warm air-mass currently in place. Another factor will be surface temperatures which are still quite warm. Heavy snow rates can certainly overcome a warm surface, but I don't think it can be completely ignored. I gave my forecast, I noted the upside potential, so of course I have to discuss what can go wrong here. There have been a few model runs that have kept the heaviest precipitation east of the Blue Ridge. If this would end up being the case, we would not get the heavier snow rates and could end up with "white-rain", snow that falls but creates more of a slush mess than anything else. I do think this is an unlikely solution but one that isn't completely off the table.